The Tulip House is nestled in the Sierra Nevada Mountains. It is the enchanting legacy of Jill Cooley, ready to amaze lovers of fantasy, of art, of whimsy. It is a home only the soul of a gypsy could envision and create. Susan Cooley is owner and 'curator' of this art gallery, and I invite you to become immersed in the extraordinary craftsmanship, the magical integration of carved wood, tile work that looks like quilting, and wonderful art collected for for decades, resulting in this wonderful and cozy home. It is a home of fairy tales and storybooks, part "Little House on the Prairie," part South Sea Island, infused with a Hobbit House and a gypsy caravan. It is located in Bass Lake, which offers fishing, jet skiing, shopping, hiking, or simply relaxing. 20 minutes from Yosemite's South Entrance. Close to the Sugar Pine Railroad. Near vineyards, museums, and art galleries. 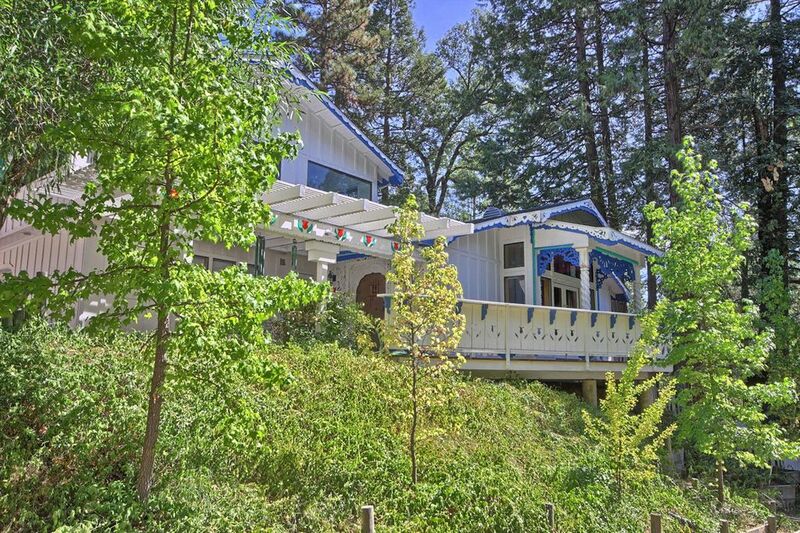 10 minutes from Oakhurst and 1 hour from Fresno Intl Airport. The home is such a great fusion of styles, of artisans talents, with nods to artist Piet Mondrian, tile work of the Alhambra in Spain, with a mix of the San Francisco Victorians, with carved doors and archways evoking Bali, and with the home spun quilting in both bedding and in tile and wood combinations. There are 2 gas fireplace/stoves, a huge well stocked kitchen. The master bedroom has a king size bed and bathroom with a huge shower. In the living room, there is a purple velvety sofa bed that has an enhanced 10" combination foam and air mattress, and the African bathroom. The second bedroom is the Loft over the garage, which sleeps 3-5 people, and has a bathroom, TV, table and chairs, and 2 recliners. There is a laundry area. Off the kitchen is a porch for lounging or for dining, and on one side, an area to barbeque. There is WiFi, cable TV, and high speed internet. There is a phone for local calls and 911. Pets are possibly accepted, and must be disclosed to the owner. It is a pet friendly house, but not one for dogs that are not house broken, or are chewers of carpets, table legs, or decks. Yep, please, if your animal has any of these bad habits, don't bring them. Of course, the Tulip House is smoke free. The house thermostat is in the master bedroom. There is an additional heater in the Loft. We will need to know what the sleeping arrangement is so we can provide enough sheets and towels. The purple couch has the enhanced mattress which consists of the standard mattress with an air mattress chamber which inflates to 10" total. Toaster and Toaster Oven is available. There are basic spices in the pantry you are free to use. The spices on the spice rack are old. I wouldn't use them. There is the dining table which can seat at least 8, and 2 counter bar seats in the island. Three smart TVs downstairs, so you can access your account. Just remember to remove it or cancel it before you leave. Yes, there is, but the reception is fairly poor. TV upstairs has a DVD player in it. You are welcome to read any books, but please only take paper back books with you. There are a very few games and toys. A wonderful selection of Perry Mason episodes!! There is a front porch, and a deck. On one side of the house is a concrete patio where the BBQ is used. The Bass Lake Area is a great place for water sports and activities. There is also fishing and hiking. As previously mentioned, Bass Lake is located some 14 miles from the South Entrance of Yosemite National Park, and the Sugar Pine Railroad. We loved this house. The interior is something you just have to see and experience. Susan was a great host and we loved the kitchen, porch and hiking trails nearby! The house is great a lot of things to look at and the location is amazing. we had a situation that we had a lot of ants in the kitchen one day and there was nothing to kill them with and when texting the maintenance guy - but this guy never answered. we had to kill the ants one by one with water and hands. not the best experience . but other then that the place was great and the owners are very accommodating. Its everything you could home for when staying in Bass Lake. So close to everything. But we didn't even want to leave the house! We will go back for sure. One of the most magical and wonderful homes we have ever stayed. Beautiful and stunning with something special ever inch. A fairytale cabin in the mountains! We had so much fun exploring all the amazing wood and tile work in the cabin. Close to town but nice and quiet. A very nice relaxing getaway!